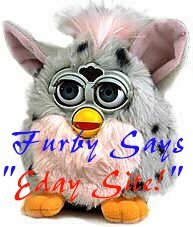 DISCLAIMER: "Furby" is a registered trademark of Tiger Electronics, Ltd. This fan site is neither endorsed nor supported either by Tiger Electronics or by its parent company, Hasbro, in any way. New! Chat Room! More Links Added! Guestbook! MessageBoard! Home / Links / Articles / Where to Purchase Online / Where to Purchase Offline / Multimedia & Misc. Chat / Mailing Lists / Newsgroups / MessageBoard / What's New !